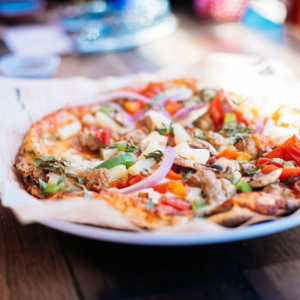 Conveniently located on Northeast Coronado Drive in the same shopping center as Target, our Blue Springs MOD Pizza is a favorite restaurant to stop for a quick and delicious lunch or dinner. We serve artisan-style pizzas and salads, superfast – and for one set price. Customize your order from over 30 ingredients – classic to seasonal, and lots of delicious stuff in between. Come visit MOD Pizza today and see what our MOD Squad can make for you! We support local schools and nonprofits through fundraisers and donations all year, along with our annual Spreading MODness campaign in November. Our Blue Springs MOD has partnered with Drumm Farm Center for Children, an organization that helps children in foster care, homeless young adults and those aging out of foster care build successful lives by providing programs and services that support forever family environments, emotional and physical well-being, educational opportunities and personal growth. Find out how MOD can support your organization or charity here.